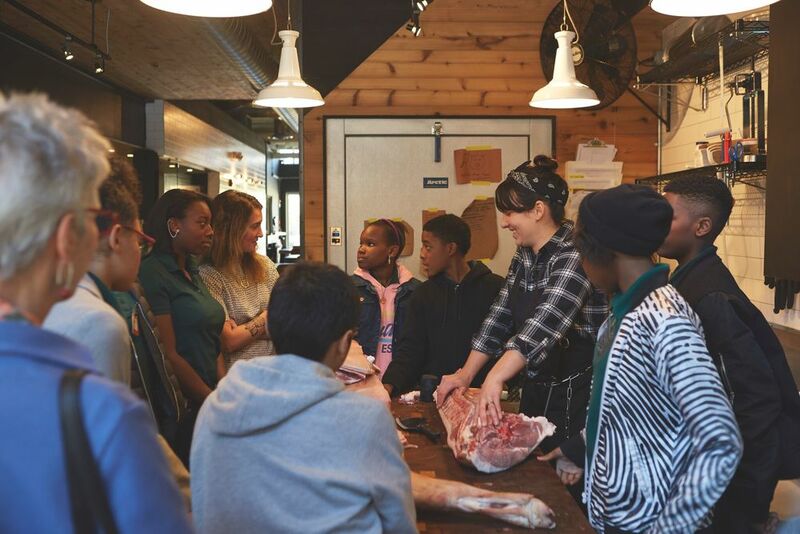 For our fourth season, Wissahickon Charter School visited the hip restaurant/ butcher shop, Kensington Quarters (Chef Damon Menapence and head butcher Heather Thomason), and Jewish diaspora style restaurant, Abe Fisher (Chef Yehuda Sichel). Nothing gets a kid interested like butchering a whole pig in front of kids. I began by teaching my students about the art of the still life, starting at the Philadelphia Museum of Art with a private tour of food-themed still life masterpieces in their collection led by Curator of Education for School and Teacher Programs, Barbara Bassett. I love seeing students interact with artwork. Their insight can be is so inspiring. 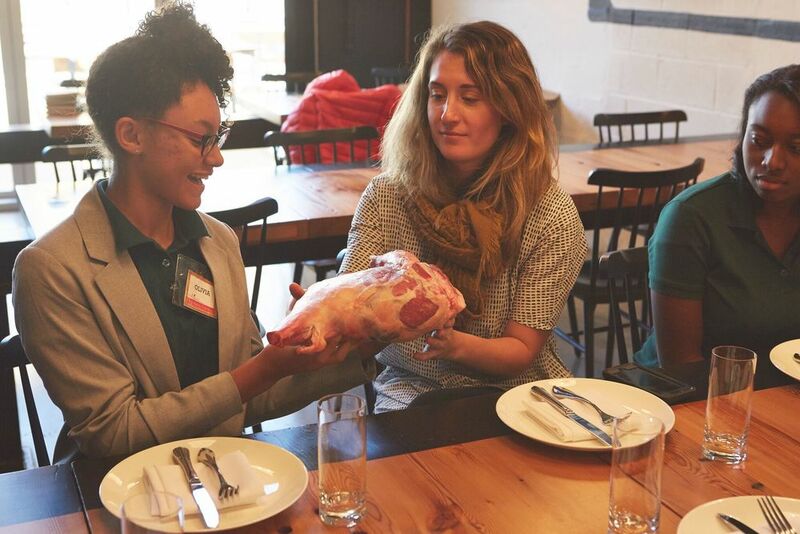 Listen to Barbara Dunden's, Fresh Artists' storyteller, podcast about P2P students experience at the Philadelphia Museum of Art's Granite Hill restaurant. 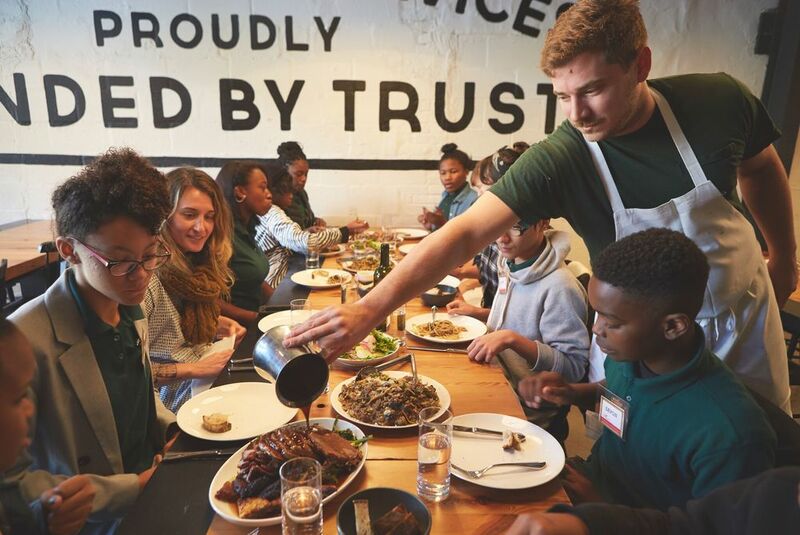 At each restaurant, students researched, met and interviewed the chef and discussed the design and branding of his restaurant. The students, as guests of the chef, were served the chef’s signature dish for lunch, then sketched a tableau of the meal in preparation for their final artwork project. The tableaux were styled by acclaimed professional food photographers, Michael Persico, Neal Santos, and Jason Varney. Our first stop was Kensington Quarters located in Fishtown. Students were in awe of the modern design of the building. I was in awe that a butcher shop and restaurant could work together cohesively. I approached Damon and Heather and they immediately said yes. Damon and Heather were so generous from their family style lunch of house made pasta with lamb, tons of bread, and a bright fall salad. 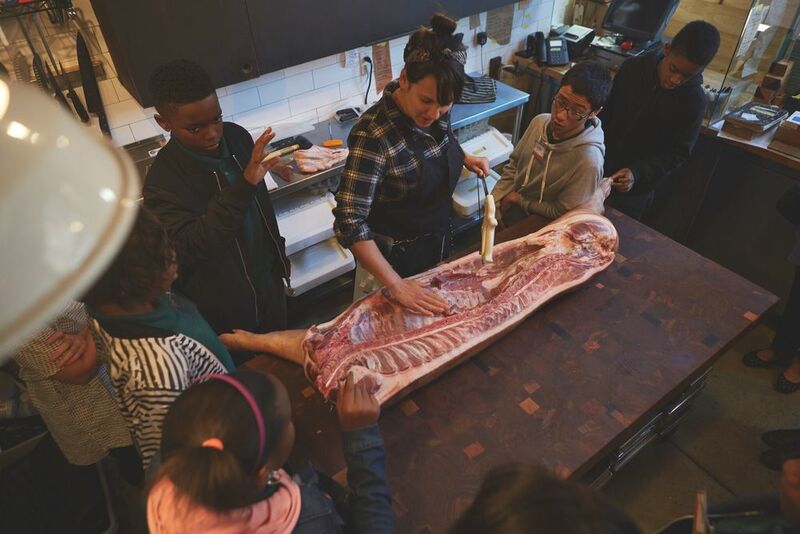 Head butcher, Heather Thomason, demonstrated how to break down a pig ethically, how to use all parts of it so their is limited waste, and took out a huge saw that engaged the kids. Nothing gets kids attention like a huge saw. Our next stop was Abe Fisher, sister restaurant to the amazing Zahav (I work there as a foodrunner!). Yehuda was my old Sous Chef at Zahav and was always interested in cooking for my students. Besides, many of my family members are Jewish and it was nice to connect my kids to my own culture. Food is a cultural experience and it's always cool to see how kids respond to food they are not use to. Returning to my art classroom, the children worked on their still life projects over a sixteen-week period, interpreting the masterpiece meals in acrylic paint using large photographic reproductions printed by Fresh Artists. The Fresh Palates-to-Palettes project culminates with several activities: a gala reception, tour of the state of the art teaching kitchens and sit-down luncheon for the chefs and project donors called Le Grande Vernissage (French for “varnishing” or private preview) hosted by Chef Michael Traud at Drexel University’s new Center for Hospitality. At that time, the students’ artwork will be displayed and each participating chef will unveil his “Le Choix du Chef” (Chef’s Choice). Wanna hear from the parents? Listen to another podcast from Barbara Dundon. 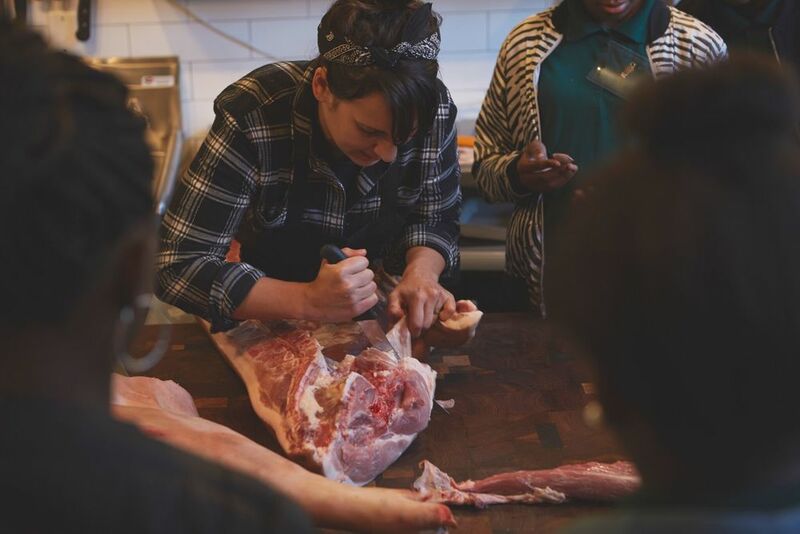 In March 2014, the four selected artists, joined by their five Chefs, will be honored by a special cooking lesson and dinner party given by Ari Miller & Sydney Hanick of Food Underground and Will BYOB, hosted by COOK, a state-of-the-art kitchen classroom. Metropolitan Bread welcomed 'Fresh Artists Palates to Palettes' project during the Rittenhouse Square Art Festival at theirMetropolitan Gallery 250 on the Square, where students gave tours of their artwork and to raise funds for Fresh Artists Palates To Palettes program for the following year.